This has not been the easiest paper to read, yet it has been vey informative, and I cannot denny that the authors (Jessica K. McCluney, Christopher M. Anderson & James L. Anderson) are quite ambitious in this undertaken, furthermore published in Nature gives it substantial weight. Their finding that “… Our analysis reveals that the biggest variations in performance among tuna fisheries are not found among the RFMOs that manage them, but rather among the final markets that they are able to reach…’ put a very interesting dent on the usual criticism of RFMOs, and I like when my small brain gets challenged like this. The authors evaluate the ecological, economic and social performance of each tuna fishery under the 5 RFMOS using the Fishery Performance Indicators (FPIs), which is a rapid assessment instrument comprised of 68 outcome measures that was developed by two of the authors (C & J Anderson, plus quite a few others) in 2015), where each Likert-scored from a low of 1 to a high of 5, along with 54 measures of governance and management enabling conditions that may affect performance. oner could criticise that, as we say In Spanish: “el que mucho abarca poco aprieta” which roughly translated means ”the one that covers a lot, can only squeeze very little”, yet that comes with the turf when you tackle big issues in a research like this one! As said is good informative paper, and I recommend you read the original, I’ll just quote the Abstract the Discussion and a the very interesting figure of this paper. We characterise the ecological, economic, and community performance of 21 major tuna fisheries, accounting for at least 77% of global tuna production, using the Fishery Performance Indicators. Our analysis reveals that the biggest variations in performance among tuna fisheries are driven by the final markets that they target: international sashimi market tuna fisheries considerably outperform a comparison set of 62 non-tuna fisheries in the Fishery Performance Indicator database, international canned tuna market fisheries perform similarly to the comparison set, and tuna fisheries supplying local markets in coastal states considerably underperform the comparison set. Differences among regional fishery management organizations primarily reflect regional species composition and market access, despite stark variation in governance, management, and other enabling conditions. With a legacy of open access, tuna’s harvest sector performance is similar across all fisheries, reflecting only a normal return on the capital and skill invested: industrial vessels slightly outperform semi-industrial and artisanal vessels. 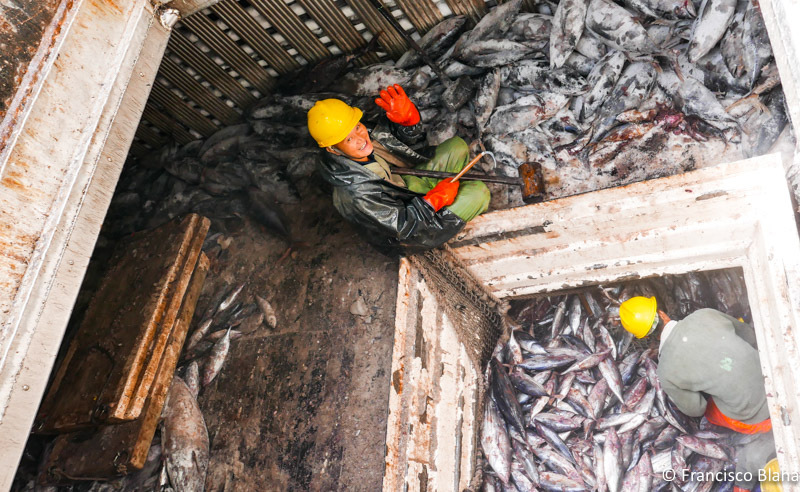 Differences emerge in the post-harvest sector however, as value chains able to preserve quality and transport fish to high value markets outperform others. Tuna fisheries represent a significant portion of global fishery volume and value, providing food, key nutrients, and a source of essential income to coastal states whose primary resource is fish. We characterize where the benefits of 21 major tuna fisheries—representing up to 96% of global tuna production—are accruing, and where there are differences in management and enabling conditions that may affect those outcomes. Our analysis reveals that the biggest variations in performance among tuna fisheries are not found among the RFMOs that manage them, but rather among the final markets that they are able to reach. Harvest sector benefits are comparable across fisheries, as historical open access and leaky limited entry has limited harvester returns to the market return to the capital and labor used. This is reflected in low scores for fisheries with low capital investment and unskilled harvesters, and in moderate scores in capital-intensive fisheries with higher operational skill. On the other hand, there is significant variation in benefits in the post-harvest sector, determined largely by how successfully processors are able to maintain the quality of the catch and distribute it into the highest paying global markets. This has important implications for current efforts by aid agencies, foundations, and NGOs seeking to identify ways developing coastal states can leverage the tuna stocks in their exclusive economic zones into sustainable sources of food and economic growth. Many of these efforts focus on strengthening coastal states in negotiating better access agreements with harvesting nations, or participating directly in the harvest sector. While fisheries have the potential to provide supernormal returns to the capital invested reflecting resource rent, tuna harvesting demonstrates only moderate performance relative to other fisheries, with differences in benefits among tuna fisheries tracking only the level of capital that must be invested at each scale. This suggests current management is not allowing for the generation of significant resource rent, and therefore that policies designed to capture resource rents from the harvest sector will have limited potential. Instead, there is more potential value in products currently being sold at low prices in local markets because simple infrastructure and handling practices do not capture or maintain export quality. While such a strategy would export micronutrient-rich protein from developing coastal states, this analysis highlights that tuna sold in local markets generates significantly less value for harvesters and processors than that sold in the international canned and sashimi markets. Many poor coastal states face geographic, infrastructure, and capital market disadvantages, and thus are excluded from the benefits of processing. This income, if captured locally through wages, returns to local capital, or resource rents, can be used to support a broader economic base, and the opportunity to purchase a more diverse diet on the world market. However, this analysis illustrates the importance of who is likely to own and work in facilities that improve value, and thus capture benefits from them. A small developing state may not have many highly skilled jobs, such as industrial purse seine captain, but it also lacks the skill base; if needed in a domestic fleet, those jobs would be filled by someone with international training. Similarly, moderate-income states often do not enjoy direct economic or employment benefits from processing plants, as local community members lack the skillset or capital to own or manage the plant, and a migrant workforce is often utilized for unskilled labor positions. While these experiences do not mean that expanding harvest or processing sector development in a particular region will not provide a local boost, they should introduce skepticism about where there are potential gains from the tuna industry. In addition to identifying broad strategies, these benchmark FPI case studies can be used to identify areas for investment by providing points of empirical comparison, highlighting areas where tuna performs well, as well as opportunities for improvement in fisheries with similar enabling conditions. Within each of the RFMO-level fisheries, there is considerable heterogeneity, and individual countries or fleets can compare themselves to their RMFO fleet average, or to identify peers from which they may be able to transfer best practices. Once a desired improvement is identified, the FPIs provide a framework for developing a theory of change. Stakeholders can choose outcome measures on which they would like to improve, and the specific enabling factors the project will modify. The FPIs can support the narrative arguing the changed enabling factors lead to the desired improvement in outcomes by providing empirical evidence, drawn from other case studies that have tried similar interventions. A well-supported narrative helps entrain stakeholders and potential funders who wish to distinguish successful approaches. As the project is implemented, progress through the narrative can be tracked by rescoring the FPIs. While any project should invest most of its monitoring and evaluation budget in data processes that support more precise measurement of its target enabling factors and outcomes, the FPIs’ rapid assessment strategy provides an affordable approach to broad-based monitoring beyond those specific project objectives, either for (possibly unintended) changes arising directly from project activity, or for exogenous changes which may affect the project priorities or the narrative supporting the theory of change. Further, the FPIs can be used for ex-post project evaluation of previous investments to identify whether and when particular strategies establish long-term sustainable benefits. The volume and value of global tuna fisheries represent an important source of both food and income for millions of people, many in low-income or developing countries. While the RFMO system has been largely successful at curtailing overfishing of tuna stocks, healthy stocks have not led to uniformly high economic and social benefits. As with many allocation issues, disagreement about the distribution of those benefits has hindered improvements, and the consensus-driven international resource management bodies are not structured to resolve these issues. The FPIs highlight where fishery benefits are accruing, and where there are opportunities to improve or reallocate them. By drawing on comparison fisheries who have preceded in targeted reforms, it is possible to develop an understanding of what initiatives successfully improve outcomes under similar enabling conditions. This understanding will be used to inform governance, management and market improvement strategies for tuna fisheries, in order to sustain and enhance the environmental, economic, and community welfare benefits generated by them.